Finnex Fugeray Planted Plus: Is It Good For Plant Growth In 2019? The Finnex FugeRay Planted aquarium LED Light plus moonlights is a slim fixture housed in a heat-dispersing aluminum case. Unlike its sister light, the Ray II, the LEDs on the FugeRay are evenly spaced. This LED alignment is great for low light and medium light plants. 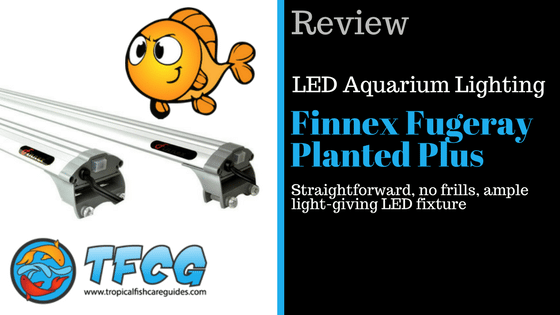 And on that note, let’s jump to the meat of our Finnex Fugeray Planted Plus review! How is Fugeray different from other models? Is this LED Fixture Right for You? As we mentioned above, there are some studies that support true red as one of the most efficient wavelengths for plant photosynthesis. If your plants get more of the light they want, they’ll thrive! Many other LEDs on the market don’t feature the 660 nm bulbs, especially the less expensive brands. The fixture is pretty much ready to go as soon as you take it out of the box–all you need to do is slide the legs into the grooves, place it on your tank, and plug it in. Hit the switch and voila–lights! Your plants are going to grow with this light (as long as your light is sized accordingly, obviously). For really heavy bio loads you might need a supplemental fixture. But if you’re looking for medium light plants in a shallow tank, this light should be more than enough. As we mentioned, setup for this fixture is simple since there isn’t much to worry about. YouTuber Brian’s Fish Tanks has an unboxing video and review for the Finnex Fugeray Planted+. The Amazon product listing for the Finnex Fugeray planted plus LED has more information on the LED counts for every available size. Some customers have complained that, while they enjoy the light while it lasts, the power supply gives out. A broken power supply can cause problems with how your light works (if it still works at all). The good news with a problematic power supply is that all you need to replace is the power supply unit. The bad news is that the replacement power supply, if you go through Finnex, is the same unit that just went south on you. The flickering lights is one problem that, for some customers, has stemmed from a faulty power supply. Plenty of customers have happily used their Finnex Fugeray fixtures for years without issue, so the potential power supply trouble shouldn’t be a deal breaker. One resourceful customer on Amazon recommends cleaning the back of the power supply with alcohol before use. When he opened his own power supply before using it, he noticed there was “flux,” which should be cleaned after manufacture and can cause corrosion. Opening and tampering with your power supply will void the warranty. If you’re uncomfortable with DIY projects, it’s better not to risk voiding your warranty. So, if you do have an issue in your first six months, you’re covered! Otherwise you can buy a new, stronger power supply that fits your light for around $30 online. The Fugeray is a good option for many tanks, but what if you need an even smaller light? The Finnex Planted+ LED Cliplight is a great option for smaller tanks (think 5 gallons). It’s essentially the same light design as the Fugeray, just in a clip-on form. Aquarium Co-op did a quick video showcasing the Planted+ LED cliplight features and demoing the fixture on a tank. He doesn’t provide planted+ par ratings in this video (like he usually does), but it’s still worth a quick look if you have a smaller tank but like what you’ve seen with the Fugeray. The Fugeray Marine II model features 10,000K LEDs, rather than the 7,000K bulbs featured on the Fugeray Planted+ fixtures. The Fugeray lacks the customisation available on the Planted+ 24/7 series that Finnex offers. If you’re looking for a fixture with an automated 24 hour day/night light cycle, check out the 24/7 line of lights that Finnex offers. Compared to other models, the Fugeray provides ample light while keeping things simple. Curious about how the 660nm true red LEDs on the Finnex Fugeray Planted Plus could potentially boost your plant growth and bring out the naturally rich colors of your plants? If you have a deep tank and a lot of plants to grow, the Finnex Fugeray LED aquarium light might not be able to support vibrant plant growth on its own. But, if you have plants that need a medium light load, the Fugeray Planted Plus could likely help your plants thrive. If you’ve read the studies on the power of true red 660nm lights for photosynthesis, and you’re interested in a straightforward, no frills, ample light-giving fixture, the Finnex FugeRay Planted aquarium LED Light plus moonlights could be a great option for your planted tank.